Committed to providing sustainable cleaning practices at all times. The Shirt Butler has an entire greener cleaning program designed to protect the health and safety of our clients as well as their children, pets, our staff, and the general public, and to do it all in a sustainable manner that minimises our overall environmental impact. We use cleaning products, consumables and equipment that are supported with evidence of minimal environmental impact. We are committed to providing safe, sustainable cleaning practices at all the times. We offer greener cleaning without losing sight of your need for cost effective services that you can rely on. Perchlorethylene, also called Perc, is a toxic chemical that is classified as a hazardous air contaminant and must be handled as a hazardous waste. It has also been shown to be a potential carcinogen, as well as posing other health risks. It can cause skin irritation and allergic reactions in some people and often leaves an unpleasant smell in fabrics. Unfortunately, it is also the most common chemical used by laundry services for the dry cleaning process. There are, however, safe, effective alternatives to Perc, namely, hydrocarbon dry cleaning solvents. Hydrocarbon solvents used today, with their high purity, are completely safe for the environment, as well as for laundry service employees and customers. Bacteria in the soil will naturally degrade the hydrocarbons, and exposure tests in aquatic systems show no fish kills when hydrocarbon solvents are introduced. By choosing a dry cleaner that uses hydrocarbon solvents, you are helping to reduce environmental pollution and are providing your family with clothes that are cleaned with a process that you can be certain will cause no health problems. In addition, your clothes do not suffer the damage wet cleaning can cause and will have a fresh clean scent rather than the unpleasant chemical smell of clothing cleaned with Perc. 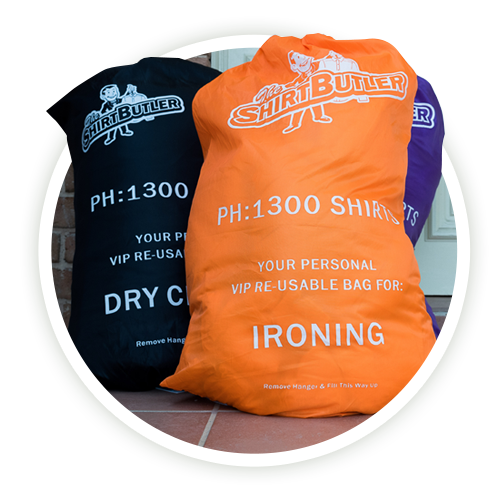 We provide all customers with a set of four VIP re-useable service bags (one for each service) at a total value of $12 to ensure that you don’t need to use additional plastic bags each time you need some dry cleaning, laundry or ironing picked up. On average these bags last over 2 years. Based on our average number of collections each VIP service bag saves the use of 65 plastic bags during it’s lifetime. That’s over 300,000 bags across our current customer base. Please return our hangers! 100% of our hangers that you return will be re-used or recycled. Upon return hangers are sorted to ensure that can be re-used without damaging garments or machinery. The re-usable hangers are then boxed awaiting re-use within the plant. All returned hangers unfit for re-use are recycled. Unfortunately we still need to use plastic covers to ensure your garments arrive at your door in pristine condition and remain that way until your retrieval. We continue to try to minimise the amount used by working with the technicians responsible for our automatic assembly machinery. The plastic covers we use are fully recyclable. 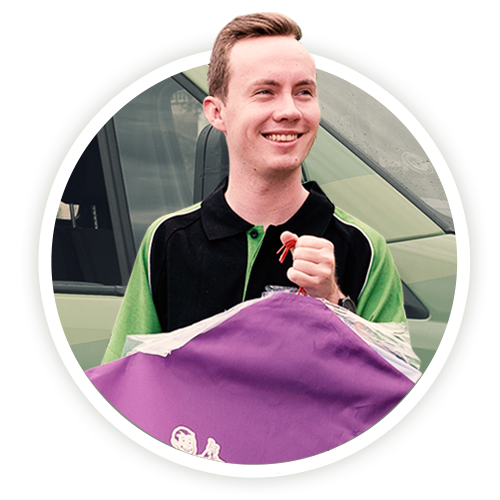 They can be dropped off at any REDcycle bin at participating Coles and Woolworths stores nationwide – or simply place them in your VIP service bag with your next order and our driver will drop them off for you. REDcycle work with Replas to ensure all the bags you return are upcycled into products such as decking, bollards and outdoor furniture. You can find out more about the REDcycle program here and Replas and it’s products here. All paper and cardboard used at The Shirt Butler is separated from other waste and recycled. Recently The Shirt Butler undertook a lighting efficiency project. This has resulted in all lighting at the Thornleigh plant being upgraded to high efficiency, low energy LED lighting in an effort to reduce energy consumption and our carbon footprint. Rather than traditional paper tags, we use re-usable heat sealed garment tags for all garment identification purposes. This leads to a current reduction in use of over 250,000 paper tags and staples/fasteners per year. Rubber bands and twist ties are commonly used by other dry cleaners to bunch garments together into orders for easier handling. These can become a hazard to birds, fish and other wildlife. In an effort to reduce these effects The Shirt Butler has completely eliminated the use of both rubber bands and twist ties in our order assembly process. Our pressing equipment has recently been fitted with steam recovery hoods. These hoods capture escaping steam that is otherwise lost into the air when pressing garments. Once captured the steam goes back into the water heating system, reducing the amount of water and energy required to produce more steam.